A powerful and moving account of the campaign for civil rights in modern America. 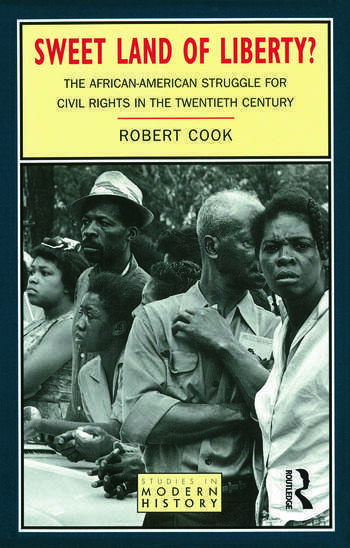 Robert Cook is concerned less with charismatic leaders like Martin Luther King, and more with the ordinary men and women who were mobilised by the grass-roots activities of civil-rights workers and community leaders. He begins with the development of segregation in the late nineteenth century, but his main focus is on the continuing struggle this century. It is a dramatic story of many achievements - even if in many respects it is also a record of unfinished business. 1. Change and Continuity in the Jim Crow South. 2. A Pre-History of the Civil Rights Movement. 3. A Movement Stirs 1940-1960. 4. The Destruction of Jim Crow 1960-1965. 5. Grass-roots Organising and the Mississippi Freedom Summer. 6. The Movement in Decline 1965-1968. 7. The Roots of Success. Robert Cook is Lecturer in American History at the University of Sheffield.